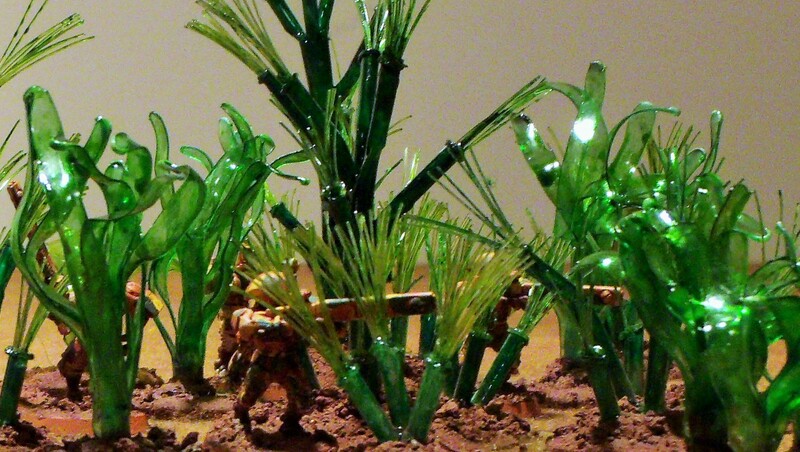 Home / 28mm Scale / Making plants out of soda bottles and straws. Making plants out of soda bottles and straws. Alien looking plants can be easily made out of old soda bottles. These are simple plants to make and can be made out of recycled materials. All you need are used plastic bottles, scissors (preferably decorative ones that don’t cut straight lines), and a candle to use as a heat source. Cut the plastic into long thin strips leaving the bases of the strips attached together. We found it easier to attach the strips to their bases prior to applying the heat, but it will depend on the style of plant you are making. Next hold the plastic above the candle and it will immediately react to heat by bending and twisting. With just a little practice you will learn to easily control the shaping of the plastic. Straws are another easy material to use in making alien looking plants. They are a little harder to shape with a candle since they are more sensitive to the heat and require a little more finesse to shape successfully. The central trunk of this plant was made using a normal drinking straw with several holes punched into it. The branches were made with smaller straws (coffee stirrers) that were shaped over with the candle. The inside of the straw was filled up with hot glue, a coffee stirrer was then inserted into each of the holes. Fishing line was used to make the tufts on the ends, but any thin stand material could work.